Home &gg; Blog &gg; Adobe Analytics, Featured, Google Analytics, Technical/Implementation &gg; Don’t Let Cookies Eat Your Site! Why it’s a problem to have too many cookies on your website, and how an analytics team can be part of the solution. When local storage is a viable alternative to cookies. The question I described in the introduction to this post is usually posed to me like this: An analyst has been approached by someone in IT that says, “Hey, we have too many cookies on our website. It’s stopping the site from working for our customers. And we think the most expendable cookies on the site are those being used by the analytics team. When can you have this fixed?” At this point, the client frantically reaches out to me for help. And while there are a few quick suggestions I can usually offer, it usually helps to dig a little deeper and determine whether the problem is really as dire as it seems. The answer is usually no – and, surprisingly, it is my experience that analytics tools usually contribute surprisingly little to cookie overload. Let’s take a step back and identify why too many cookies is actually a problem. The answer is that most browsers put a cap on the maximum size of the cookies they are willing to pass back and forth on each network request – somewhere around 4KB of data. Notice that the limit has nothing to do with the number of cookies, or even the maximum size of a single cookie – it is the total size of all cookies sent. This can be compounded by the settings in place on a single web server or ISP, that can restrict this limit even further. Individual browsers might also have limits on the total number of cookies allowed (a common maximum number is 50) as well as the maximum size of any one cookie (usually that same 4KB size). The way the server or browser responds to this problem varies, but most commonly it’s just to return a request error and not send back the actual page. 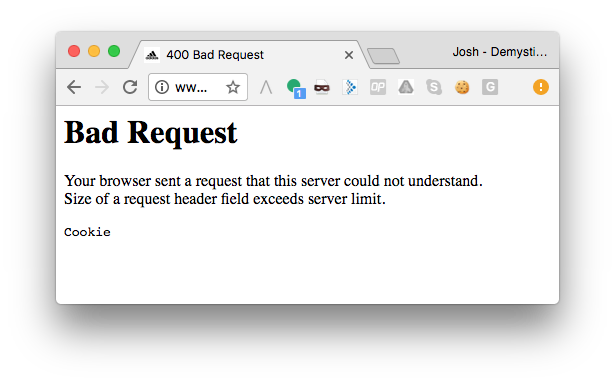 At this point it becomes easy to see the problem – if your website is unusable to your customers because you’re setting to many cookies that’s a big problem. To help illustrate the point further, I used a Chrome extension called EditThisCookie to find a random cookie on a client’s website, and then add characters to that cookie value until it exceeded the 4KB limit. I then reloaded the page, and what I saw is below. Cookies are passed as a header on the request – so, essentially, this message is saying that the request header for cookies was longer than what the server would allow. You’ve probably noticed that your analytics tool sets a few other cookies as well – usually just session cookies that don’t do much of anything useful. You can’t eliminate them, but they’re generally small and don’t have much impact on total cookie size. A lot of that tech debt exists because marketing teams are loathe to prioritize fixing bugs when they could be prioritizing new functionality. It really doesn’t matter whose fault it is – if your customers can’t navigate your site because you are using too many cookies, or your network is constantly weighed down by the back-and-forth of unnecessary cookies being exchanged, there will be an impact to your bottom line. Everyone needs to share a bit of the blame and a bit of the responsibility in fixing the problem. But it is important to help your IT team understand that analytics is often just the tip of the iceberg when it comes to cookies. It might seem like getting rid of cookies Adobe or Google sets will solve all your problems, but there are likely all kinds of cleanup opportunities lurking right below the surface. One thing to note when compiling a cookie inventory is that your browser will report a lot of cookies that you actually have no control over. Below is a screenshot from our website. You can see cookies not only from analyticsdemystified.com, but also linkedin.com, google.com, doubleclick.net, and many other domains. Cookies with a different domain than that of your website are third-party, and do not count against the limits we’ve been talking about here (to simplify this example, I removed most of the cookies that our site uses, leaving just one per unique domain). If your site is anything like ours, you can tell why people hate third-party cookies so much – they outnumber regular cookies and the value they offer is much harder to justify. But you should be concerned primarily with first-party cookies on your site. If you find that Adobe has productized a feature that you used to use a plugin for, get rid of it (a great example is Marketing Channels, which has essentially removed the need for the old Channel Manager plugin). If you find the same data actually lives in 2 cookies, get the appropriate teams to work together and consolidate. This is the real topic I wanted to discuss – whether local storage can solve the problem of cookie overload, and why (or why not). Local storage is a specification developed by the W3C that all modern browsers have now implemented. In this case, “all” really does mean “all” – and “modern” can be interpreted as loosely as you want, since IE8 died last year and even it offered local storage. 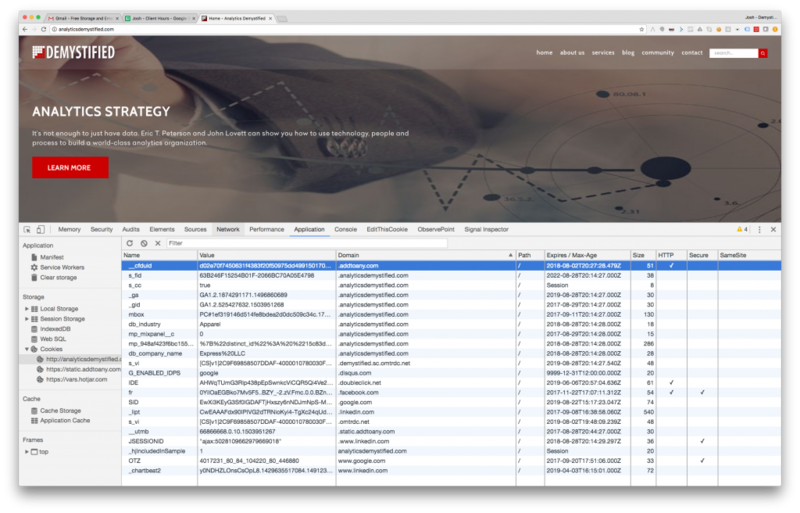 Browsers with support for local storage offer developers the ability to store that is required by your website or web applicaiton, in a special location, and without the size and space limitations imposed by cookies. But this data is only available in the browser – it is not sent back to the server. That means it’s a natural consideration for analytics purposes, since most analytics tools are focused on tracking what goes on in the browser. However, local storage has limitations of its own, and its strengths and weaknesses really deserve their own post – so I’ll be tackling it in more detail next week. I’ll be identifying specific uses cases that local storage is ideal for – and others where it falls short. Hi Josh! Great post, thank you! I look forward to the local storage discussion. We have lots of questions internally about how we use local storage for personalization applications – like what should we store in their as part of the visitor profiles to support faster retrieval so we don’t have to go call an API each time a profile is needed. Would love to hear your thoughts around using local storage for that. Thanks!